Rock Your Randomness | Arianna Merritt, M.Ed. 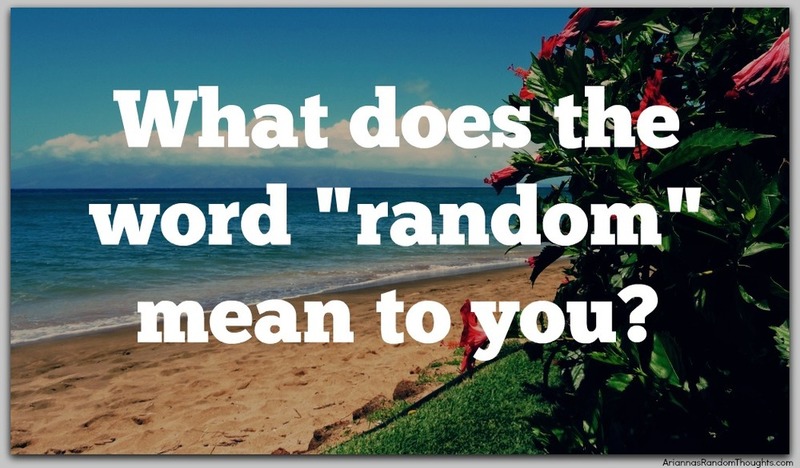 What does the word “random” mean to you? For the past five years, I have been associated with the word “random” due to my blog. Choosing the word by chance years ago to be the core of my blog’s name has truly impacted my journey! Being “random” is really meaningful to me, as this word truly encompasses my journey after graduation. “Random” is defined, to me, as moving forward without knowing the outcome. As a new graduate, sure you don’t know what the future holds, but you do have one thing that can hold you fast: your attitude. How you frame your thoughts, whether they be positive or negative, impacts your life. Despite graduation being an exciting stage of accomplishment, many graduates mask their fears about the uncertainty of what lies ahead. Beginners on their professional journeys, they don’t know where they will end up or where their career road will lead. When I found myself coming up to the final year of my graduate degree and unsure of what the future held, I randomly started blogging as a way to share my thoughts. Until then, I had everything planned and my next steps mapped out. Blogging helped me to figure out the new stage I was entering ‘after graduation’ - when the path was wide open and I didn’t know what was next. Instead of seeing the transition as scary, I took a leap and had faith that things would work out. Often, people want to rush this essential step of discovering what you were meant to do with this beautiful life you have. How many times have you achieved a monumental accomplishment and the first question people ask after congrats is “what’s next?” Trust me, spend time and enjoy what was just accomplished and be in the present moment as it passes so quickly. We need to spend time going through all steps of the self-discovery process even when we don’t know the outcome. What do you think of when you hear the words, “I don’t know”? For many years, saying “I don’t know what the future has in store” made me uncomfortable, as I connected it with lack of confidence. I was stuck on seeing the term “I don’t know” as a negative thing (as if I didn’t have all the answers) or as a stumbling block. Over time, instead of seeing the words “I don’t know” as a stopping point, I learned to cherish them as a starting place for my personal and professional growth. After learning to accept myself and admitting to not being perfect, I began to crave situations where I didn’t know the answer - I could learn more and challenge myself. 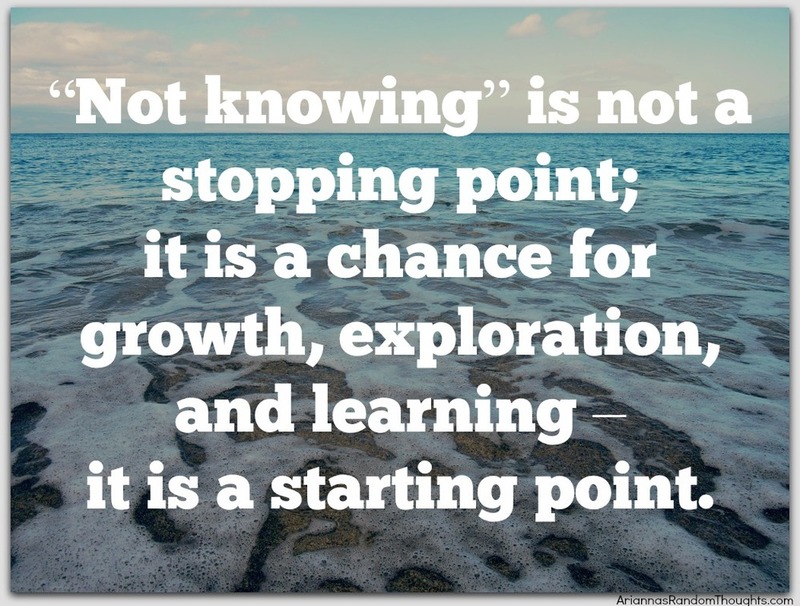 “Not knowing” is not a stopping point; it is a chance for growth, exploration, and learning – it is a starting point. I came up with the name “random thoughts” because my blog was a place to share the insights I came across on my path. Through sharing my random thoughts in an adventure journal as I was discovering them on my journey of self-discovery – I empowered you all along the way! The posts start off as “random thoughts” in my head that come to me as I experience the world. Then through journaling about them and processing them – I find the nugget of wisdom that I was meant to learn. That’s why my thoughts are “random” as they are what I come upon on my adventures. I have no set plan – I don’t know what I will randomly learn along the way or how and where I will learn them. I am excited to figure out what I will discover along the way. Life is lived in the moment – and only when we reflect back can we see the bigger picture. When I reflect back on my experiences – I realize that they are not random but they were placed to teach me. I had the choice to learn from them. “Random” means “proceeding without knowing the outcome” – that is what life is about – going out into the world without knowing what you will discover but having faith that things will work out. Moving forward without knowing the outcome was one of the best things that I ever learned and something I practice daily. I love leaving space for unexpected random sightseeing that will occur en route. There are so many beautiful things if you live your life with the attitude of wonder. How boring would life be if everything was planned out already?! That’s why Arianna’s Random Thoughts tagline is: let your journey be meaningful and your faith strong! Life after graduation can be stressful; we can all gain strength from each other! My vision for this site is to renew hope in all of you beautiful people who are struggling to find a job and start your professional lives. You may be seeing your life from a negative lens. Yes, your vision may be fogged because you may not have a job currently and not know what your next step is; but this is not permanent state. Things will get better. How you frame your thoughts, whether they be positive or negative, impacts your life. Let’s choose the positive. Life is an adventure. There’s no shame in not knowing. It’s the 1st step of discovery. Never lose your sense of wonder. Come on the journey with me! Be You. Stand Tall. Rock Your Randomness.